PRESQUE ISLE, Maine — Shyquinn Dix is wrapping up his sophomore year of college studies and aiming to prove a lot of people right about the value of second chances and alternatives to incarceration. 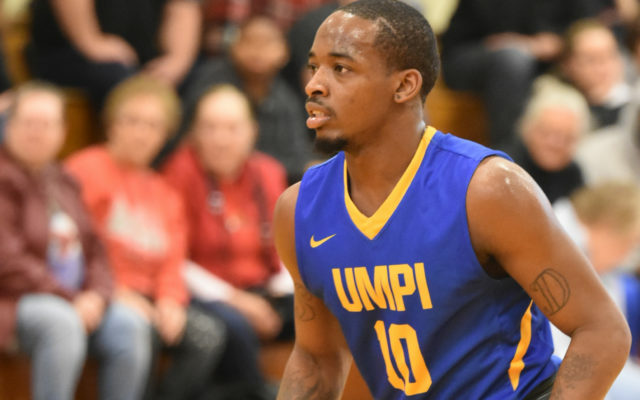 Dix, a social work major and a point guard on the University of Maine Presque Isle’s basketball team, was featured recently in a CBS TV 60 Minutes episode that highlighted a new Connecticut prison intervention and rehabilitation program. Dix, who grew up in Stamford,Connecticut, was serving a four-year sentence for check fraud when he enrolled in the German-inspired Connecticut prison intervention program for young adults. Known as TRUE, for truthful, respectful, understanding and elevating, the program takes young prisoners into a new housing wing and offers mentorship, job and skills training, and personal development classes with the aim of lowering the recidivism rate for former inmates. In his late teens, Dix quit a college program in Nebraska to return to help care for his two young sons in Connecticut. Dix found himself in a maximum security prison with inmates sentenced for a range of serious crimes and all spending 22 hours a day inside of a cell. In his first year at the prison, the state of Connecticut started the new TRUE program aimed at young people like Dix, who would be out of the prison after a few years and at risk of returning. The TRUE program was set up around the principles of prisons in Germany, where the recidivism rate is 50 percent less than the United States. Rather than a model based entirely on punishment, the German prison system and the TRUE program emphasize rehabilitation. Dix applied to and enrolled in the program with the goal of returning to college and learning new skills. A corrections officer on staff in the program, James Vassar, took note of Dix’s efforts, as well as his basketball skills. Through an acquaintance, Vassar got in touch with UMPI athletic director and men’s basketball coach Dan Kane, floating the idea of encouraging Dix to consider enrolling at UMPI. After some background work and back and forth communications, Kane met with Dix and told him that he could potentially apply to UMPI and try out for a spot on the basketball team. Dix continued in the TRUE program and eventually earned a two-year reduction in his sentence, partly with the help of Kane and based on his plans to enroll at UMPI. In the summer of 2017, Dix arrived in Presque Isle ready to restart college academically and while playing in the NCAA’s Division 3 North Atlantic Conference. With two years left of university, Dix said he is focused on his academics as a dean’s list student, enjoying basketball and his future career.